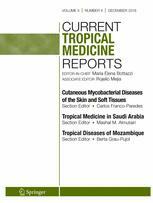 Current Tropical Medicine Reports provides expert views on recent advances in the field of tropical medicine in a clear and readable form. The editors appoint leaders in important divisions of tropical medicine to select topics for review by experts who assess the latest developments and highlight recent significant papers. These review articles also report recently published papers of importance in the references, which are accompanied by annotations explaining their importance. The range of topics includes virology, bacteriology, parasitology, entomology, immunology, cell and molecular biology, epidemiology, ecology, behavioral science and clinical medicine.